Metal roofing systems provide an outstanding value for property owners looking for an alternative to conventional shingle roofs. Improvements in recent years have made metal roofing systems a cost effective option, providing an aesthetically pleasing, energy efficient, and weather tight construction. Builders Construction Services, Inc. (BCS) proudly supports general contractors and builders throughout the state of Texas with a full line of metal roofing products and accessories from our newly expanded facility in Central Texas. BCS is an authorized manufacturer of Sheffield Metals Engineered Metal Roofing Systems™, providing engineered concealed fastener metal roofing systems and custom trim packages to fit any structure. Rest assured that when you partner with BCS you will receive prompt, personalized service and outstanding product fabricated specifically for your project. 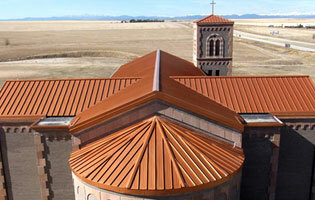 Metal roofing systems are an investment in your property providing long-term value and peace of mind. 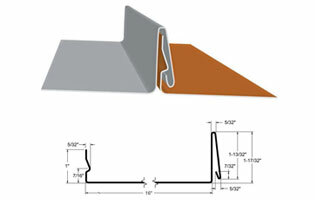 Available for new construction or retrofits, solid substrate or open framing. Finishes are warranted for 35-40 years, depending on paint selection. Designed to reflect more sunlight and absorb less heat, a metal roof can save you money. 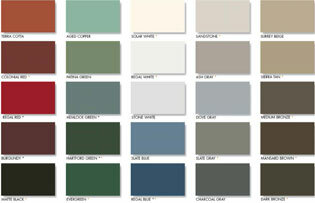 Many of our paint finishes are Energy Star and LEED 2009 compliant. Stands up to harsh weather conditions better than conventional shingle or tile roofing, puncture resistant, and Class A Fire Rated. Metal panels are attached to the roof and snapped together forming a seam that “stands” above the roof’s drainage plane, with no exposed fasteners or screws..
Over 50 colors to choose from. Panels are available in a wide variety of gauges, widths and substrates for low and steep slope applications. Decking layers and better quality materials ensure no vibration occurs and will actually silence noise from rain, hail and bad weather. Metal panels require no maintenance. And with a life span of up to 150 years, there is no need to replace after storms.